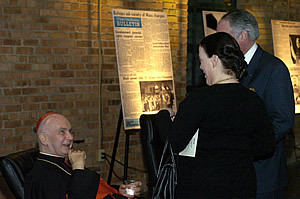 Cardinal John Foley, Grand Master of the Order of the Holy Sepulchre of Jerusalem, visited with Eileen and Jim Noble at “The Great Catholic Get-Together of 2011” Jan. 6 at the Nicollet Island Pavilion in Minneapolis. 2011”at Nicollet Island Pavilion in Minneapolis. About 250 guests, along with the staff and board of directors of The Catholic Spirit, sampled appetizers while learning about the history and future of the newspaper through standing displays and interactive web presentations. The newspaper was founded as The Catholic Bulletin on Jan. 7, 1911. Local meteorologist Paul Douglas was the emcee for the evening, which also featured remarks by Cardinal John Foley, grand master of the Knights of the Holy Sepulcher and former head of the Pontifical Council for Social Communications; Archbishop John Nienstedt; and associate publisher Bob Zyskowski. To read their remarks, visit the Spirit Blog. The Catholic Community Foundation will hold its annual Investment Conference from 11 a.m. to 2 p.m. Wednesday, Feb. 9, at St. John the Baptist in New Brighton. Participants will get an in-depth look at the Catholic Community Foundation’s investment performance in 2010 and learn about how St. Odilia in Shoreview built a $1 million endowment. Register for this free conference by Friday, Feb. 4, at http://www.ccf-mn.org or by calling (651) 389-0300. Glenn Caruso, head football coach at the University of St. Thomas in St. Paul, has been named the Division III national football Coach of the Year for 2010 by Liberty Mutual. The award includes a $50,000 gift to Caruso’s designated charities as well as a $20,000 donation to St. Thomas’ Alumni Association. Caruso led the Tommies to an MIAC championship and to the national playoffs during the 2010 season. Ty Erickson has been named CEO of Regina Medical Center, a Catholic-affiliated hospital and senior living facilities in Hastings. Previously, Erickson was CEO of the Columbia Gorge Service Area in Hood River, Ore. He also served as CEO at Rainy Lake Medical Center in International Falls and as assistant administrator at Sacred Heart Hospital in Eau Claire, Wis.
Forest Lake native Aaron Michael Smith was among 61 Legionaries of Christ ordained to the priesthood on Christmas Eve in Rome. Father Smith is studying for a licentiate in theology and does youth work in Florence, Italy. The Association of Catholic Colleges and Universities will present Immaculate Heart of Mary Sister Amata Miller with the Monika K. Hellwig Award for her contributions to Catholic higher education through service and academic work at its annual meeting in Washington Jan. 29-31. Sister Miller is an economics professor and director of the Myser Initiative on Catholic Identity at St. Catherine University in St. Paul.